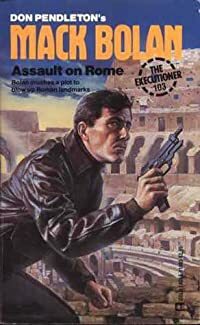 The savage murder of a U.S.
diplomat leads Mack Bolan to Italy and into the deadly domain of a former enemy - the reborn Red Justice Column. From its headquarters in the labyrinthine catacombs beneath the streets of Rome, this killer cult is holding the Eternal City hostage. The Executioner assumes the role of assassin for hire and crosses swords with the RJC once more. But this time he intends to sever its head and stop the fall of Rome.